The former drugs cheat is hoping to stop others going down the same route he did. 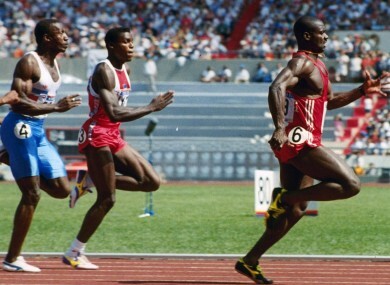 Johnson (right) leads Carl Lewis and Linford Christie at the Seoul Olympics. DISGRACED DRUG CHEAT Ben Johnson has resurfaced as the unlikely face of a new anti-doping campaign aimed at helping athletes stay clear of risking banned substances. The Jamaica-born Canadian was sensationally stripped of his 100m gold in the 1988 Seoul Olympics after testing positive for stanozolol, a banned anabolic steroid. But Johnson is now heading up the #ChooseTheRightTrack campaign, which aims to radically improve a system that athletes are still breaching today. “Winning a gold medal and being the best in the world, it cost me my reputation, my life,” Johnson said. “I’m here to try and change that. “I’m trying to clear the air and clear my part of life, trying to help future generations and future athletes, athletes of my calibre, who have tested positive, been in the same boat as me, trying to help them and say you’re not alone. Johnson said that in the early 1980s, doping was rife and the temptation of glory had proved too much for him. Athletics’ world governing body, the IAAF, announced this month that it will impose four-year bans from 2015. But the #ChooseTheRightTrack campaign is calling for more. It wants a truly independent and suitably-funded World Anti-Doping Agency under which an athlete support council should be set up, the Press Association reported. It also wants a comprehensive truth and reconciliation process, although that will require gaining the athletes’ trust. Email “Disgraced Johnson looking to make amends with new anti-drugs campaign”. Feedback on “Disgraced Johnson looking to make amends with new anti-drugs campaign”.